Commerce Resources Corp. reported an intriguing new discovery on its Eldor Rare Earth Property in Quebec yesterday, announcing high tantalum-niobium grade boulders which rank impressively against other top deposits worldwide. As much attention has been focused exclusively on advancing Eldors primary asset, the Ashram Rare Earth Deposit, yesterdays results are an unexpected surprise. While developing the Ashram Deposit, recent work has focused on infill and step-out drilling as well as metallurgical investigations. We published articles in December and January explaining the significance of Commerces metallurgical breakthrough with the Ashram Deposit. Our assessment was echoed by Luisa Moreno, Mining & Metals Analyst with Euro Pacific Capital, who said in a recent interview: I think [Commerces recent Ashram deposit] results are very positive. Commerces latest news is in regards to regional exploration activities at the Eldor Property. The results represent boulder sampling of a larger mineralized body present on the property and highlight the potential for the property to host at least 4 highly sought-after commodities: tantalum, niobium, rare earth elements, and phosphate. Numerous, extremely high-grade mineralized boulders were collected with samples assaying up to 1,220 ppm Ta2O5, 15,700 ppm Nb2O5, 11% P2O5, and 0.5% TREO (enriched in the HREOs). The tantalum grades alone are amongst the highest in the world, whereas mining operations consider grades in excess of 300 ppm Ta2O5 as high-grade. 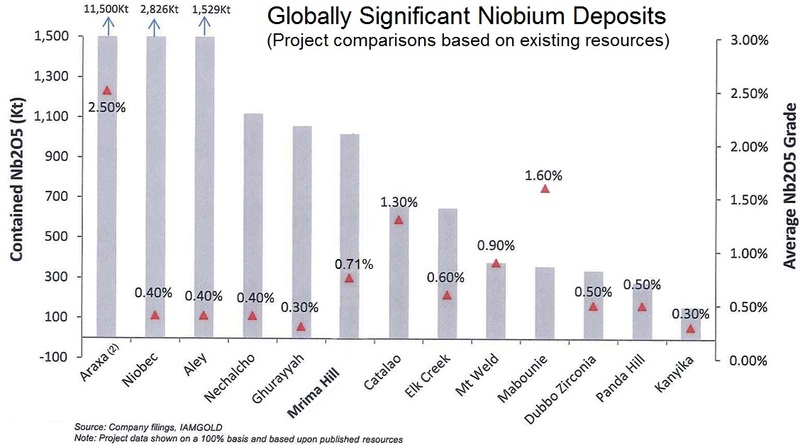 The niobium grades compare very well to producing mines and are above average to most known niobium deposits. Further, Commerce has sampled even higher tantalum and niobium at Eldor with a peak of 160,900 ppm (16%) Nb2O5 and 7,540 ppm Ta2O5 from a boulder,in addition to multiple >10% Nb2O5 boulders reported historically. The results are encouraging to say the least and we believe the potential of these results should be pursued. - Following trails of indicator minerals helped lead to the discovery of the rich diamond deposits in Canadas Northwest Territories. - Commerces latest boulders were tracked in a similar fashion to the boulder train discoveries at Patterson Lake South by Fission Uranium Corp. and Alpha Minerals Inc. in the Athabasca Uranium Basin. - The Ashram Deposit on Commerces Eldor Property was originally discovered by following boulder trains. - The exploration team at Dahrouge Geological Consulting Ltd., who originally discovered the Ashram Rare Earth Deposit and the Upper Fir Tantalum-Niobium Deposit, also played a role in the discovery of Patterson Lake South. Dahrouges experience with rare metal deposits, such as the Upper Fir Tantalum-Niobium Deposit and Elk Creek Niobium Deposit, gives us confidence in their understanding of these types of commodities and how to explore for them in several environments. We value it as highly significant that prior mineralogical work completed in the Southeast Area of the Eldor Property indicated that the commodities are hosted in only 2 minerals (namely Ta-Nb-REE-enriched pyrochlore and P2O5-enriched apatite), which are both well-known from a metallurgical point of view as only those minerals have the best chances of being economically extracted that have been commercially processed elsewhere in the world from similar rock types; such as the Niobec Mine (pyrochlore) and the Cargill Mine (apatite), both of which are located in Canada as well. Stunningly, the pyrochlore mineralization within the boulders on Eldor is very coarse grained, which additionally leads to the conclusion that the mineral processing may be very straightforward. - The Niobec Niobium Mine (operated by IAMGOLD Corp.) in Quebec is in production with a grade of 0.42% Nb2O5. Commerce has now discovered more than 30 boulder/outcrop samples grading >1% Nb2O5 indicating a host body on the property of similar grade. 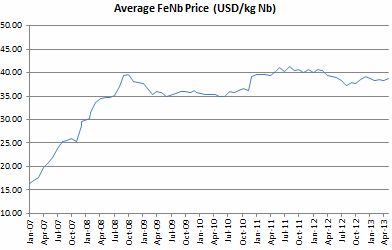 - Global Advanced Metals Pty Ltd. produced tantalum with a head grade of 220 g/t Ta2O5. Commerce has now discovered more than 80 boulder/outcrop samples grading >300 g/t Ta2O5. Further, high grade tantalum mineralization is often associated with significant niobium mineralization. An additional factor to consider with tantalum grades generally is that pegmatite hosted deposits typcially host higher grades than carbonatite deposits, albeit with lower recovery rates than the carbonatite deposits. This means that there is also a good possibility that such high grades encountered in a carbonatite complex will have higher recovery rates. - CBMM operates the worlds largest niobium deposit in Araxa (Brazil) with an average mineralization of around 2.5% Nb2O5 (but with a 50% recovery). Historical assays from 2007 showed grades between +1% to 11.4% Nb2O5 on the Eldor Property, which numbers actually drove Commerce to acquire the property in the first place. The historic tantalum-niobium sampling, coupled with the recent high grade results, strongly indicates the potential for Commerce to discover a second high grade deposit on the Eldor Property adjacent to the Ashram Deposit. Note that these are sample results from Commerce are not indicative of defined resources or mineable reserves. What they do show though is the opportunity Commerce is exploring. 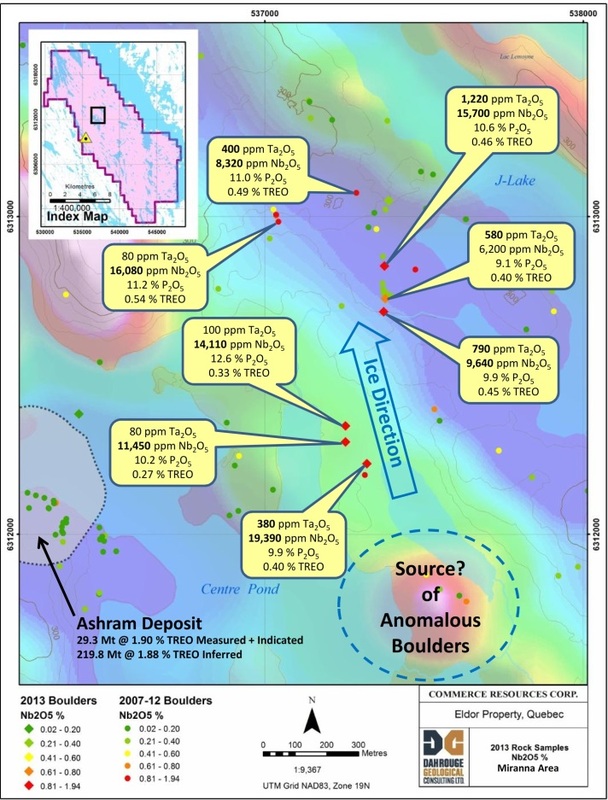 As management has already defined major deposits of rare metals (Upper Fir) and rare earth elements (Ashram), the potential of these results are significant in terms of the likelihood for a large new discovery on the Eldor Property adjacent to the already advanced-staged Ashram Deposit that is in pre-feasibility study phase at the moment. "Since the acquisition of the Eldor Carbonatite in early 2007, exploration has identified multi-commodity potential on this claim group. This was first realized with the discovery of the Ashram Deposit which now ranks amongst the world´s largest REE projects. The truly significant aspect of these current results is the future exploration potential of the overall Eldor Carbonatite where other commodities, identified in boulders, soil surveys and outcrop, include: niobium, tantalum, phosphate, copper and nickel. 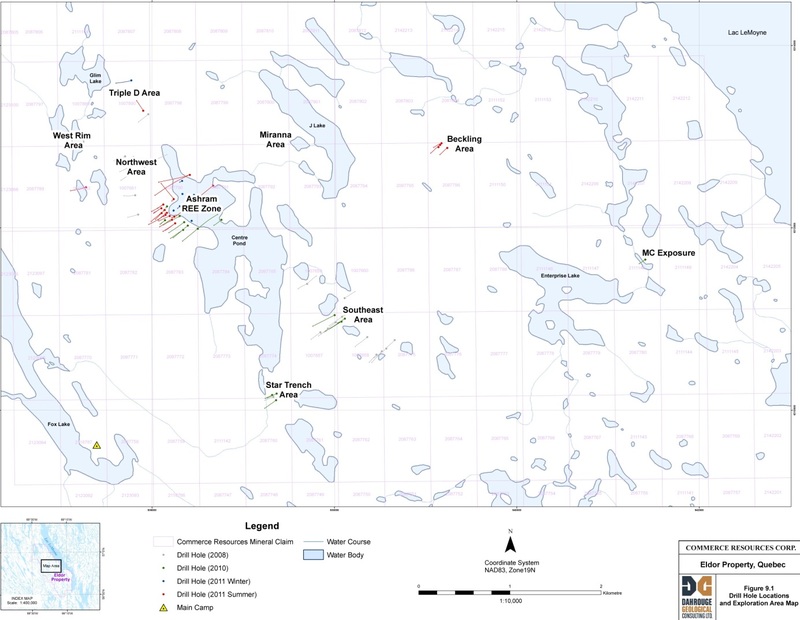 These early stage results point out a clear long term direction for Commerce, in that when Commerce is successful in establishing industry partners to advance the Ashram Rare Earth Deposit, as well the Upper Fir Tantalum and Niobium Deposit into production, Commerce will have multiple targets to begin the process of exploration and discovery again on both claim groups in Quebec and British Columbia."